OXFORD, Miss. 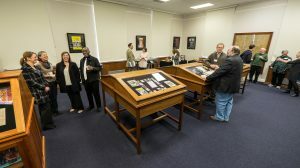 – Scholars will explore the literary and family connections shared by Mississippi authors Eudora Welty and Hubert Creekmore during a brown bag event at the University of Mississippi’s J.D. Williams Library. The event, set for 11:30 a.m. Oct. 6 in the Faulker Room, features a discussion by literary scholars Suzanne Marrs and Annette Trefzer about Welty and Creekmore, an accomplished poet and author from Water Valley. The library’s Department of Archives and Special Collections organized the examination of “Eudora Welty and Hubert Creekmore: Literary and Family Connections.” Selected items from the department’s Welty and Creekmore Collections are featured as a part of the exhibition “Hot Off the Press: New and Newly Available Archive Collections,” which is on display in the Faulkner Room through December. “We are honored to have two such accomplished scholars speak about the connections between two outstanding Mississippi literary figures,” said Jennifer Ford, head of the department. “The Creekmore Collection is one of the treasures of the department, and the current exhibit offered a wonderful opportunity to display items from it for the first time. Marrs, friend and biographer of Welty, is a retired English professor from Millsaps College. She met Welty in 1983 and they were close friends until the author died in 2001. The two met on nearly a daily basis to discuss literature, travel and politics and to welcome visiting writers and scholars to Jackson. Trefzer, an associate professor of English at UM who has taught graduate and undergraduate classes on Welty, has studied American and Southern literature and also has extensive knowledge of Creekmore. Marrs will discuss connections between the Creekmore and Welty families, and Trefzer will focus on the literary achievements of both authors. Creekmore, although not as well-known as Welty, was an editor, translator, author, poet and reviewer known as an overall “literary man,” Trefzer said. Besides being the brother of Welty’s sister-in-law, Creekmore served as the aspiring author’s literary adviser when she began writing fiction, Trezfer said. Creekmore studied at Ole Miss and graduated in 1927. Welty and Creekmore’s relatives donated some of his works to the Department of Archives and Special Collections. The library is working to digitize Creekmore’s collection, and Ford hopes it will be available online by the end of 2017. Visitors are welcome to bring lunch to the lecture and can view the “Hot off the Press: New and Newly Available Archive Collections” exhibit from 8 a.m. to 5 p.m. Mondays-Fridays through Dec. 16.